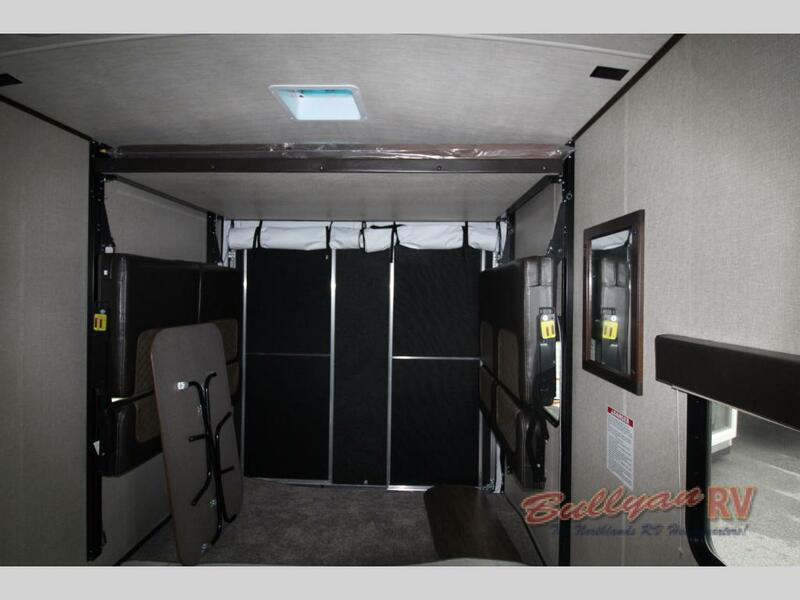 Enjoy upscale fifth wheel toy hauler comforts in an easy to tow travel trailer toy hauler size with the Heartland Torque XLT Travel Trailer Toy Hauler. 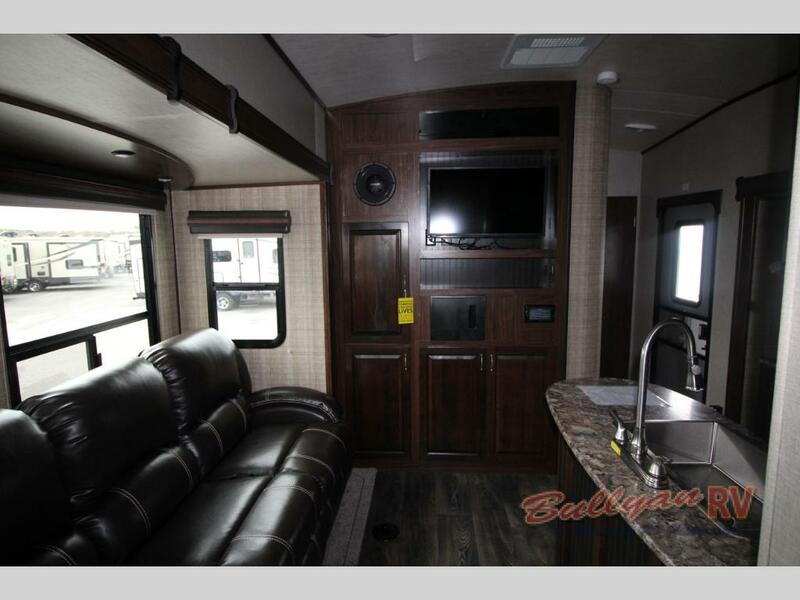 Inside and out, this impressive RV is packed with high end amenities toy hauler RV enthusiasts are sure to love. As you walk inside, you will be struck with the luxurious furnishings in the kitchen and living area. Designer furniture, matching window treatments on huge picture windows, built-in entertainment centers, quality-crafted cabinets and residential furnishings are just a few of the features this travel trailer toy hauler has to offer. Models features an 8′ 6″ wide body plus either a single or double slideout, providing an impressive amount of interior space. 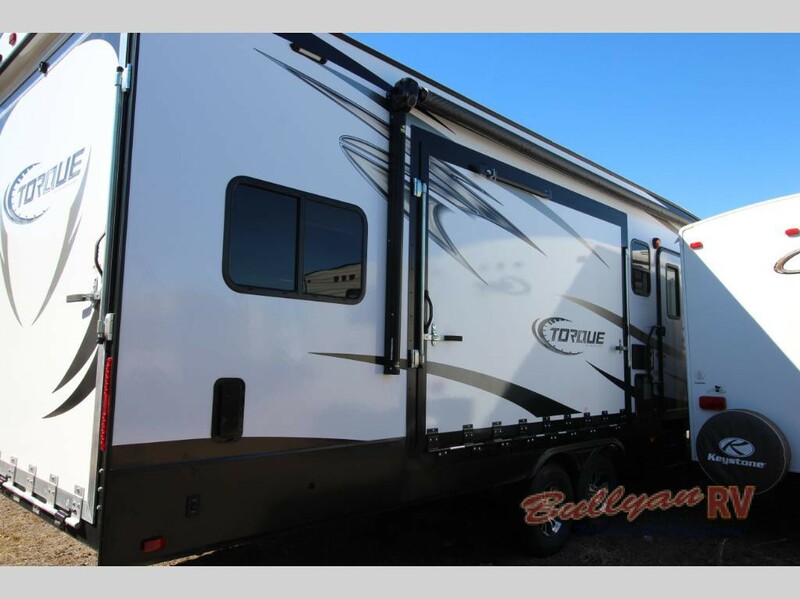 One floorplan, the Torque XLT T32 even has a fold out side patio for all your entertaining needs. In the kitchen you will find upscale amenities such as a high rise kitchen pull-out faucet, steel ball bearing full extension drawer guides, 8 cu ft refrigerator, stove top with oven and microwave. 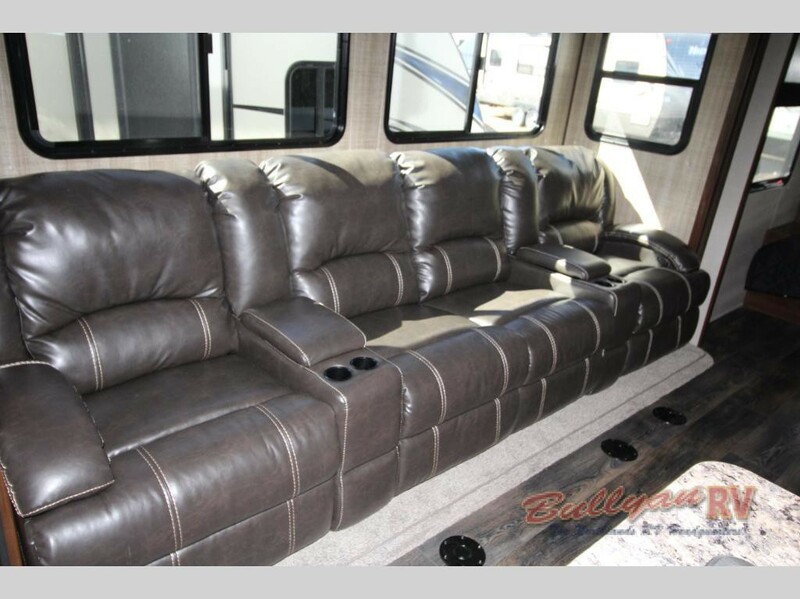 Rest easy in plush theater seating with cup holders, perfect for relaxing and trading stories of your fun day out on the trails. High end walnut cabinetry adds a touch of richness all though out this good looking trailer. Moving to the separate garage area, you will find a well equipped and durable dual purpose space for safe transport of your off road vehicles plus comfortable additional living space. Many models offer a 12′ garage space with a power drop down bed. 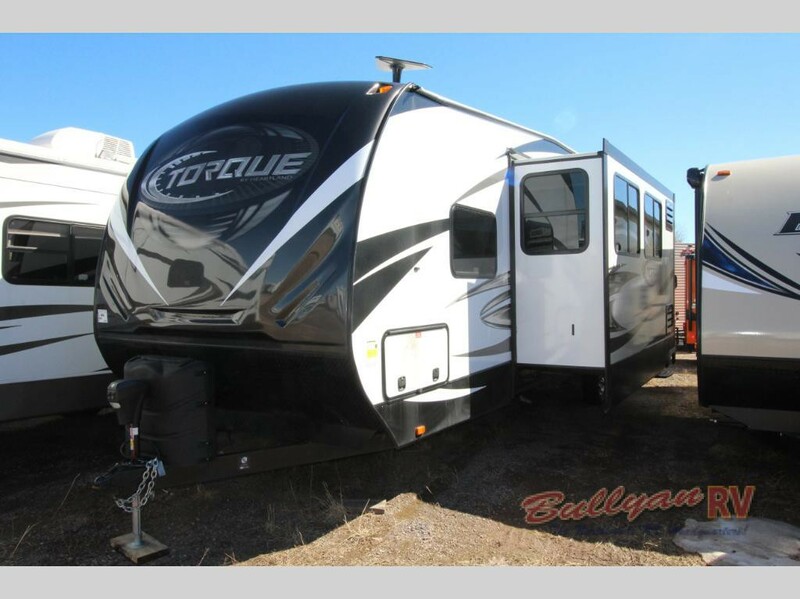 Check out the Torque XLT T31 with a second half bath off the garage area. This extra bathroom provides easy access for guests and campers with dirty shoes. Ducted A/C and heat in the garage area allow you to spend time hanging out here even if the weather outside is not ideal. The 3000 lb high capacity ramp door with 24″ beavertail allows you to load and unload your vehicles safely. 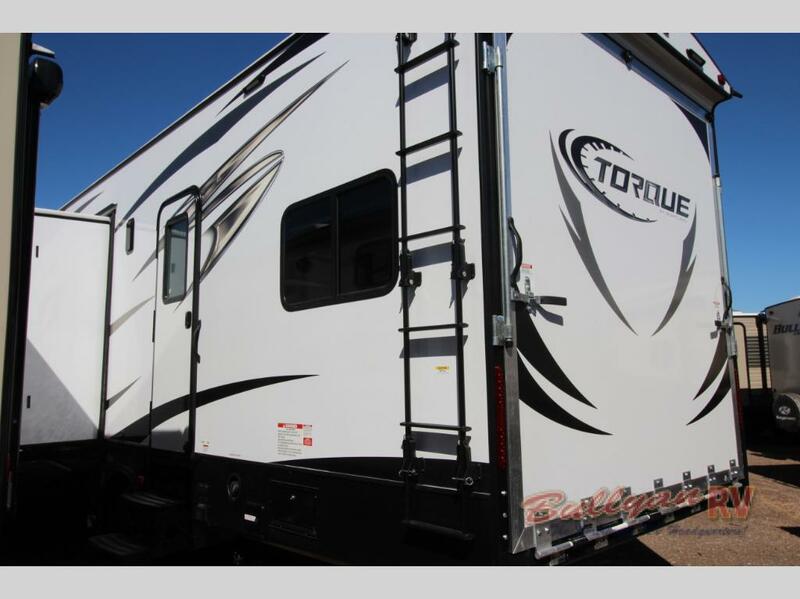 The exterior of the Torque Travel Trailer Toy Hauler is just as well equipped. The fuel station with pump, power awning, power front jack and eye catching fiberglass front cap are just a few of the additions that make this Toy Hauler really stand out from its competition. To take a tour of the Heartland Torque XLT Travel Trailer Toy Hauler, Contact Us at Bullyan RV or visit us at Our Location. It’s time to hit the trails! Why not treat yourself to some luxury too!